The anatomy of aircraft rescue and firefighting (ARFF) trucks, while similar in intent to municipal fire apparatus, have a number of major differences that affect how they look, their configuration, performance, and how they are used. In comparing an ARFF truck with a municipal fire pumper, the municipal pumper pulls up to a scene, hits a hydrant, and can sit on the scene and pump for hours on end. In contrast, ARFF firefighters don’t have that luxury on an airfield because there are few hydrants in such a large operational area, so the ARFF truck must carry all the extinguishing agents onboard, with the idea of extinguishing a fire within two minutes. Matt Reda, international ARFF product manager for E-ONE, says that a typical ARFF 4×4 truck, such as E-ONE’s Titan™ 4×4, will carry 1,500 gallons of water and enough foam solution for two full water loads. “Whatever the size of the water tank, the foam tank is 14 percent of that to give enough foam to handle two loads of water,” Reda says. Many ARFF trucks also have dry chemical systems onboard to handle three-dimensional fires, such as fuel spilling out of an engine or from a pressurized fuel source. ARFF trucks have greater acceleration abilities than their municipal counterparts, Reda notes. An ARFF 4×4 carrying 1,000 gallons of water must accelerate from zero to 50 miles per hour (mph) within 25 seconds, while an ARFF 6×6 that carries 3,000 gallons of water must accelerate from zero to 50 mph in 35 seconds, Reda says. ARFF trucks also need higher horsepower (hp) engines to achieve mandated performance requirements. Where a municipal pumper might have a 500-hp diesel engine, an ARFF 4×4 will use a 670-hp diesel engine, and an ARFF 6×6 a 770-hp diesel engine. Another difference in an ARFF truck’s anatomy is that it must be able to go off road at higher speeds but still be stable because many times aircraft come down off the runway, Reda says. ARFF trucks always are all-wheel drive, he adds, and need off-road treads on larger tires to negotiate poor soil conditions. Pump flow rates on ARFF trucks are typically greater than those on municipal pumpers. The Federal Aviation Administration minimum requirement for an ARFF 4×4 is a pump that will produce at least 1,500 gallons per minute (gpm), although Reda notes that most 4×4 units use 2,000-gpm pumps. For ARFF 6×6 trucks, pumps range from 2,000- to 3,000-gpm models. “You have to have enough capacity to flow to a roof turret, bumper turret, under body nozzles, and two 1½-inch preconnected side lines, simultaneously,” Reda says. Seating capacity in ARFF trucks also is different than that in municipal pumpers. Typically, ARFF trucks carry a maximum of four firefighters in the cab; however, most are set up to allow the vehicle to operate with only the driver, who can engage all truck functions from inside the cab. 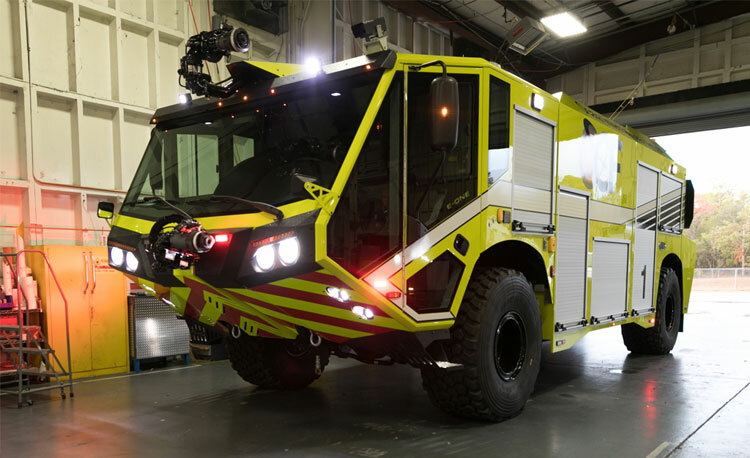 While compartmentation can be an issue on an ARFF vehicle because many departments want to carry as much equipment to the scene as possible, Reda says E-ONE’s new Titan 4×4 has 360 cubic feet of compartment space, while the new Titan 6×6 has 320 cubic feet of space.